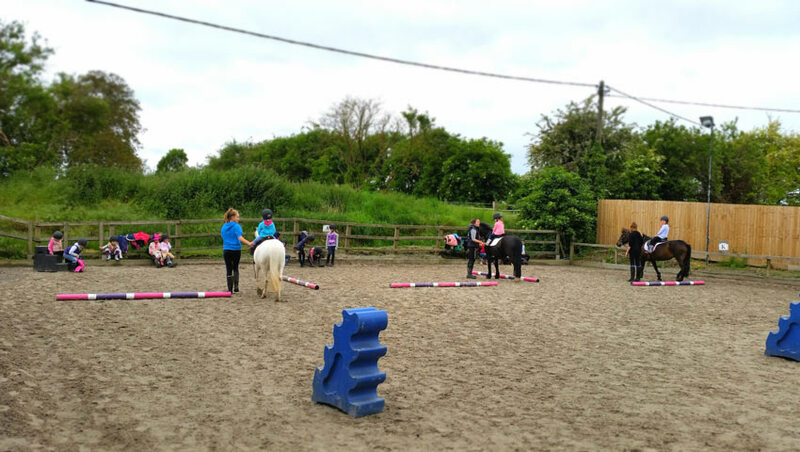 If you are looking for something different for your child’s next birthday, then a Birthday Party at Hartwell Riding Stables is the perfect solution. Our parties are suitable for complete beginners, experienced riders, or anyone in-between from 2 years of age upwards. Children will have great fun riding and interacting with the ponies in a safe and fun environment, monitored and instructed by our experienced team. Our Standard Pony Party Package consists of a one-hour gymkhana – which involves engaging the children in team games, races and challenges on ponies – followed by a 30 minute grooming and plaiting session where the children can learn how to properly groom the ponies and make them all pretty with flowers, feather boas and lots of clips to dress them up with. There is also 30 minutes afterwards if you would like to bring a Birthday cake or party food. We have two picnic benches outside on the yard and a converted stable with tables and chairs, please be aware there is no heating in this room. Also included are party cups for each child containing sweets, a giant natural candy horse Lolly or Hartwell Belgium Chocolate horse head each, a rosette each and special rosette for the birthday child. We require a minimum of 6 children (including the birthday child) for a birthday party. 6-8 childen = £35 per child. 9-12 children = £30 per child. 13+ children = £25 per child. In addition to our standard package we offer tailor made birthday party packages which can be arranged to suit your needs. In the past we have included different riding experiences e.g. mini field hacks (dependant on time of year), party bags, personalised birthday cake and treats etc. POA, just give us a call or drop an email to discuss options. Premier parties POA, please enquiry directly with your needs and we will do our best to accommodate.